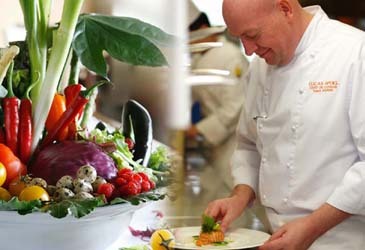 The Grand InterContinental Seoul's upscale 34th floor restaurant, Table 34, will be featuring until the end of August the fresh and nutritious salad creations of the Chef Lucas Spoel. Unlike most salads, these "Summer Salads" are highlighted by special ingredients including duck, crusted lamb fillet, salmon, and chicken thigh. For the traditionalists, Caesar salad and green summer salad are also available. Imagine indulging yourself in pan seared duck along with sour cherries, baby lettuces, mint and molasses dressing or treating yourself to warm smoked salmon and spicy mango with red chili, roasted peanuts, coriander and ginger. Go ahead and enjoy the experience for these salads will leave you feeling quite satisfied. The price for Chef Spoel's summer salads ranges from 15,000 won to 17,000 won. (VAT and service charge are not included.) (02) 559-7631.